One of the central questions in biodiversity conservation is how much habitat to conserve.10,11 Unfortunately, this is also one of the most difficult to answer because it requires detailed, long-term information not only on habitat requirements, but also on the population dynamics of native species. In developing a guideline for the amount of late-successional forest, we have used two approaches: (1) Coarse filter: we used information on natural disturbance regimes and resulting age-class distributions of presettlement forest derived from the literature. 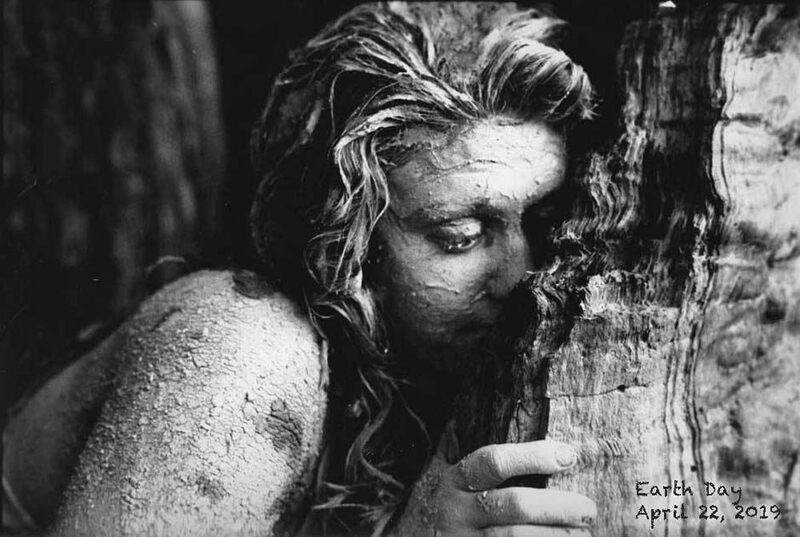 As emphasized in the Introduction, the coarse-filter approach is based on the assumption that native species evolved under conditions existing before extensive human alteration of the North American landscape. Thus, maintaining a full range of similar conditions under forest management offers the best assurance against loss of biodiversity.12 (2) Fine filter: we developed spatially explicit population viability models for a known late-successional forest associate, the northern flying squirrel. Defining which parameters constitute the components of the habitat needed by mature forest-dependent species is challenging because of the number of species involved and our limited understanding of even the most abundant ones. 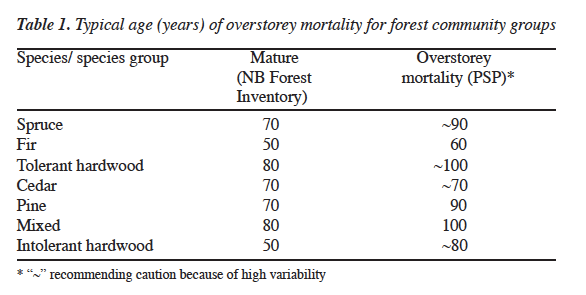 Therefore, we have established two bases for defining maturity: (1) the age at which stands show signs of overstorey mortality (senescence), and (2) thresholds in structural stand-level attributes that allow persistence of mature forest-indicator species. We used a broad index of maturity to provide a surrogate for the habitat requirements of many species. Maturity is defined as the onset of significant mortality of the overstorey cohort of trees. Permanent sample plot (PSP) data from New Brunswick were used to calculate the age at which tree mortality typically occurs. Not enough PSP sites exist in the GFE to use only local site data. Small sample sizes for some tree species in the PSP data limit some conclusions, so these data should be considered with some caution. The analysis of the PSP data set was conducted for seven broad community types in the GFE (see Ch. 3, Forest Community Groups). 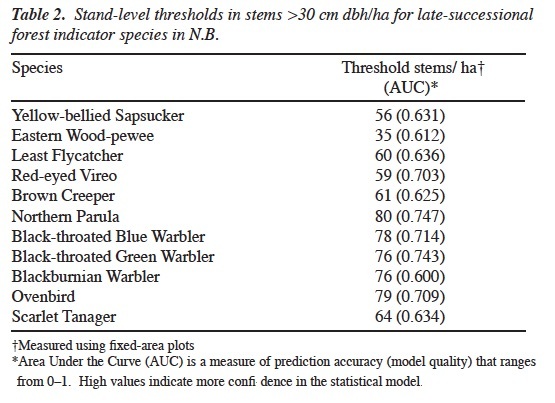 Based on these analyses, and on data from the New Brunswick Forest Inventory,13 the onset of maturity can be defined for species and the communities composed of these species (Table 1). For most forest species, it is unlikely to be stand age alone that influences abundance and distribution. A wide range of structural (e.g., canopy cover, tree size) and non-structural (e.g., stand history) attributes that are correlates of stand age, may form the real bases for habitat quality. 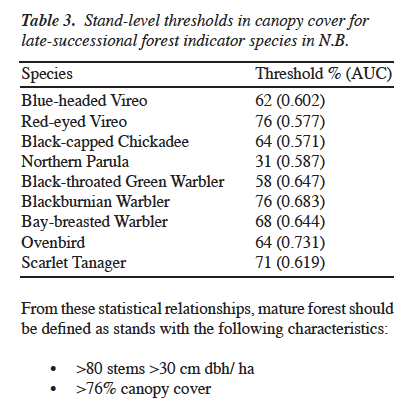 For several species associated with mature forest, habitat relationships have been examined extensively in the GFE14 and other parts of N.B..15 We used results of statistical models that related the presence of a wide range of forest bird species to vegetation structure variables.15 Of particular relevance are thresholds in the occurrence of forest species as a function of variables that are associated with mature forest and are strongly influenced by forest management: (1) canopy cover, (2) density of large (>30 cm dbh) trees/ha. Threshold values can be interpreted as the amount of vegetation variable “x” required at the stand scale to maximize the probability of correctly predicting species occurrence. Nine species were correlated with canopy cover and 11 with large trees (>30 cm dbh). 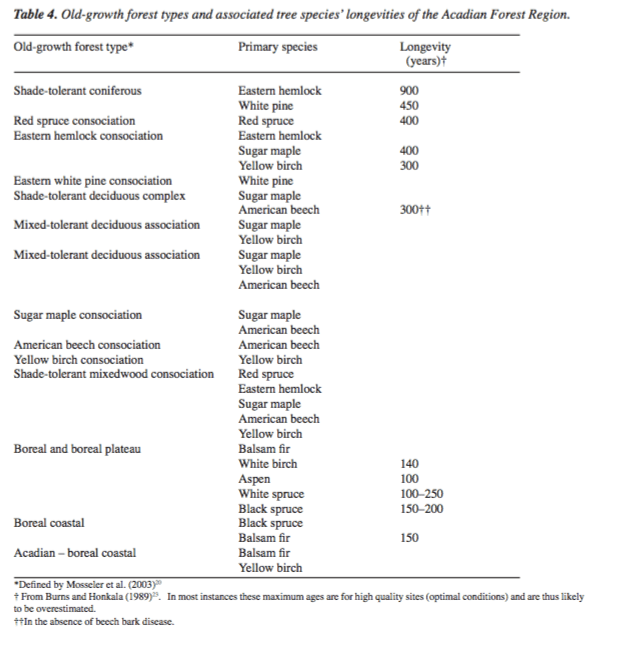 Habitat requirements of these species serve as the basis for characterizing late- successional forest (Tables 2, 3).